Today we are going to talking about the most frequently questions asked by newbies many times & sometime most of them confused for a long time to choose Blogspot or Wordpress for theirs blogging careers. Blogger and wordpress becomes the most popular and prominent platform in modern era. There are millions of users on the internet using blogger & wordpress CMS systems. But for a single author it becomes very difficult to say which one is better & has more potential than other one. However it has been discussed many times by pro bloggers and some of them recommended that wordpress is better due to its professional features while most of them have a strongly voiced that blogger is the top CMS and seo friendly platform which should be used for blogging journey. Providing Free Hosting: This is the second major benefit why most of bloggers using blogger platform. because it providing free web-hosting you do not need to pay for web-hosting.. You just only need to buy a custom domain name. 100% Trustworthy Server: Being a Blogger you should must stay your blog live on every 7/24 hours. Do,not worry it is automatically secured by Google. While due to google server your blog will stay alive each 7/24 hours. UN-Hackable: You already know that blogger is own by google and google is the no1 tech-company throughout the world. So it is solely secured by Google Official from all types of damages or hacking resources. SEO Friendly: Blogger is all the time SEO friendly and robot lover because it is own product of Google so google recognize it very well than all of others. Blog Speed: However we have personally received dozens of comments from worpress user that why wordpress blog is taking more time in loading page than Blogger Blog. There are many reasons. One of the best answer is that blogger blog is simply coded in Xml/Html and Css while Wordpress blog is created in Php. So blogger will always one step forward than wordpress in this regard. Google Owned: You already know that bloggers is google platform so it will make blogger blog seo friendly for all popular search engines. Easy Customization Template: You might have heard that blogger template is fully prepared in Html/Css and Xml so it becomes very easier to customize it template. SEO friendly: Wordpress is used by all popular bloggers using it because it has tons of plugins for SEO. Wordpress has tos of seo plugins which help to rank it well in search results. There are uncountable SEO plugins available for wordpress platform. Tons of SEO Plugins: There are tons of plugins available for wordpress blog. These plugins make the blog seo friendly and make it perfect for search engines robots. Quickly Rank: Due to alot of plugins it becomes seo friendly for robots and get massive traffics from search engine. These SEO plugins are easy drive traffics to wordpress blog. Template Collections: There are Hundreds of default templates inside wordpress platform. Wordpress has more than 70+ builten professional templates which are well known for robots & having awesome designing. Easy To Use: Wordpress is matching up like Blogger. A newbie blogger can easily operate WordPress blog in a seconds becasue it has simple layout and easy to navigate. Lack Of Hosting: One of the biggest problem by using blogger platform is it web-hosting management. You do not allow to customize and operate with these data ( hosting ) because they have been hosted on google servers. We could not make any changes inside the blogger hosting. Lose Rank Quickly: This is one of the oldest problem in blogger platform whenever you do not publish for a week or some days then your blog will continuously losing the ranks. It mostly depend on how often the blog is update. without updating your blog will lose the rank if it has been hosted on blogger platform. Difficult SEO Strategies: Proper SEO is the key to success for every blog & website. In blogger platform you will have to do alot of manually SEO it doe not provide us SEO plugins like wordpress blog. So it much difficult for blogger user to apply proper SEO strategies on blogger blog. No Compatibility with popular Language: As we have already learnt that blogger template is created in Html/Css and Xml so there is no way to embade Php or Asp coding inside blogger template. Blogger platform is limited in comparability. Difficult To Customize Theme: This is one of the biggest problem that you cannot easily customize CSS/Html inside wordpress template. Wordpress template mostly codded in PHP language which is very difficult to edit or customize. Purchase Web-Hosting: Wordpress does not provide free web-hosting you have to spend 20$ for hosting and 10$ for domain name which could be not easy for common man. Security-Hacking: Wordpress is not secure as blogger and it very very difficult to maintain proper security for wordpress blog. Thousand of wordpress sites hacked by hackers using hacker software. 35 Blogs Per Accounts: you can create 35 blogs on each wordpress account. exceeding the limit you will have to delete your older blogs. while on the other hands we can easily create 100 blogs per account in blogger. Hi guys this post is all about Blogger & Wordpress comparing advantages and disadvantages which telling us that which one is the best platform for search robots. 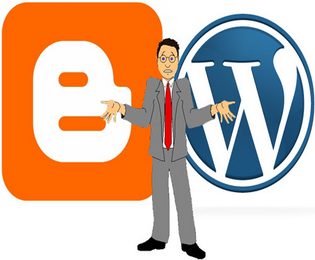 Blogger vs Wordpress which is better. we have mentioned several reasons in the above paragraph of each one now its depends upon you how you differentiate between these two platforms. Do not forget to share your ideas with PBT readers. Thank & Happy Blogging. Dear thanks for your lovely words we want you here all the time. be around with PBT. hope to see with next tutorial. Thank for sharing such a great information Please keep it up and I am waiting for new post here. thanks for sharing bro and it also depends on choice of a person as blogger is easy for him or wordpress just like our interests. Yes Ahmad Bro we did not say that blogger has more potential than wordpress or wordpress is much more than blogger we have only find the difference and limitations. now it depend on the choice of a person which one is suited for his/her. Thanks & keep visiting us. Thanks for making readership with PBT. Nice post but You have written that, Blogger blog quickly loose rankings when it is not updated. It is not an issue with blogger blogs only. Update really matters. It doesn't matter, whether you are using blogger or WordPress. If you are not updating your blog regularly, You will loose ranks and that's for sure. You have missed a major disadvantage of using blogger blogs. You can't sell Blogger Blogs because they are hosted at Google server. People transfer admin privilages but still is not a legal way of selling blogs. Once recognized, Google disable such account. How to Sell a Blogger Blog-Is it Legal or Illegal? Thanks Ravi Bro for you suggestions we like your words and we totally agree with you. Bro actually i have written this post twice first time i have written it very well but in the last when i was going to write final words then my mozilla firefox crashed out thats why i written it again but not that first time and with no mores explanation there is also some grammar mistake i made in this posts. Thumbing up to geteverything.org. Yes absolutely right newbie should must start theirs blogging careers with Bloggers because of it easy to use and easy to navigate. wordpress mostly codded in PHP which is very difficult to customize. thanks shakeel bro for commenting here i want see you with PBT readers all the times. Dear You have not sent me email yet ? please send me asap. Thanks Arshad Majeed bro for liking our jobs. We always in touch with you to bring somethings unique. Thanks for commenting here with PBT. Dear sorry for that here is electricity problem now we have send it to your account check it now. There will be Hafeez Khan. very Great Mr. "Hafeez Khan". The post that you have shared with us is very useful. The most and good content of this post is its title "Blogspot vs Wordpress Comparison..."
awesome guidelines dude, generally newbies choose blogger blog as it more user friendly to those who don't have technical knowledge. Even i am used to blogger. I am totally agree with all the advantages and disadvantages you had mentioned above. Thanks Umesh Bro for commenting here we totally agree with your words. These are really very useful knowledge about which one is better wordpress or blogger. Being a blogger user some time people ask about its. So should strong focus on its. Thanks Victor Bro for your valuable comments and shares the your ideas with PBT readers. Yes we analyzed then there an unlimited features of using blogger platform. Nowdays we see that there is a great increases-ability on Blogger CMS system. People like it due its additional features like have mentioned above. Thanks for coming here and want to see you soon here. Yes dear This post will guide every newbie bloggers when it comes to choose which platform should be right for his/her. Hope we have mentioned all the major advantages and disadvantages of using both platform so it depend upon them which will be considered CMS system for them. Thanks For landing on PBT. Hafeez Khan your awesome post i like it a lot. I need to ask some question to you ? If you don't mind. Yes brother you may ask question related to blogging. we are present here all the time 7/24 hours. If you have any query then feel free to ask feel its you home. Thanks for liking our jobs & appreciations. See you in next tutorial. I agreed blogger is best for every point of view. My Question is That Why Blogger Deleted our Blogger Blog without any notification? I am scared cause i tried hard to make a single blog. i dont wanna loss or my blog going to be delete? I think that's why every person go to word wordpress. Please you are advised to read blogger policy you will be know the fact. There is more possibilities that blogger could easily delete our blog. I love wordpress because it allows freedom to work with everything.. I tried blogger only once but within minutes, I switched back to WordPres..
Just a little suggestion on the disadvantages of WordPress. If you are talking about WordPress.Com than you will also get free hosting like how you can get with Blogger, and also after getting 2-Step Verification feature now WordPress.Com blogs are nearly impossible to hack. So, if you saying about WordPress.Com than freely Remove 2nd and 3rd disadvantage. Also, if you are talking about WordPress.Org (self-hosted) than you should know that there is no limitations on it, and you can create unlimited. Note: Before publishing any article about anything, be sure to own learn what is this, as I am sure that you was don't know about this, or if you was already know than you should write that on the article also. Have been on wordpress for almost 7 years now and no complaints. I quit blogger because it was very unflexible and i found it difficult to go self hosting with them. But that was years ago. When I visited this post first, I have a thought in my mind that this post would be like others, in which at last of post winner will be declared either blogger or wordpress. But, I like your way to leave it to readers for making decision for choosing their-selves. Well! blogger is best newbie bloggers for starting their blogging carrier. As if they choose wordpess, they have to pay some dollars but what if they would like to quit blogging. Abhishek Raj, first time commenting here. I have used all CMS around the world. I am now using hosted wordpress for my personal blog http://www.iamzwaki.tk but it has been hacked twice. Now I would like to go back to blogspot for security reasons only. My legal website is hosted in weebly.com . The platform is also very stable and easy too. But I like blogger. Most of my sites and blogs are hosted in wordpress but i am thinking that it is the time to change only for security reasons only. I also like next big CMS the ghost blogging platform which is being under develop. Very soon I will leave my hosting and shift my blog to blogspot. Because I love blogspot which was my first blogging platform. Thanks for your good comparisons article about blogger vs wordpress. Bloggger ROcks ....... when the updates are coming for Blogger ?? as you said that wp is easily hackable but it is not a true if you install plugins such as botnet attack blocker,bullet proof security,wordfence security,limit login attempts they just make your wp a highly secured website. the major proof is allbloggingtips.com which is based on wp.it loads faster than a blogger. I am new to this world. May I ask you if you are using Wordpress or Blogger for your website (Probloggertricks.com)? I agree with your all points. Wordpress is not secure from hackers and also difficult in use. That's why i choose blogger platform. thanks for the post firstly you information and tips are very helpful.please update more related to stock market. Great article......Local SEO Services will help you to get top spot in search engine results when someone is looking for the exact products or services you offer and for specific location where you are located. Nice information. The Idea of seo is the importance and latest technique to improve the visibility of search engine and give them a unique content to allowed them and create a perfect deal in seo. Thanks for sharing. I have to admit that I have never heard about this information I have noticed many new facts for me. This is nice for service for every website owner. Also you are giving us all about seo tips so many many thanks for your service. Lots of great, thank you so much for the informative article share with us, In fact your creative writing ability has inspired me. As a blogger this information is very useful for me to make new blog on which plate form. very impressive blog thanks for sharing the information. Wordpress is yet powerful comparing to bloggers, yes that also true wordpress is still not compatible for adsense.